"This basic sequence of the shooter genome has been in place for a while now, and perhaps that’s enough for some people. 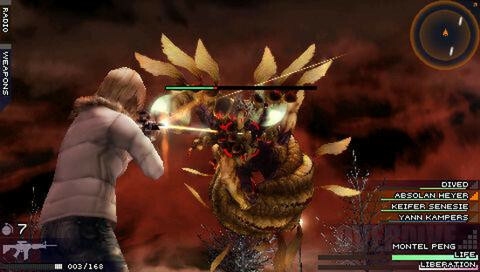 But no one puts Aya Brea in a new game without tweaking a little DNA." Notice it’s not called Parasite Eve this time around. Maybe The 3rd Birthday wants players to forget that name, because Aya Brea, the franchise’s strong female lead, doesn’t quite remember anything either. Her amnesia from an alleged traumatic event has made her sheepish now, frail sounding, and shy of battle. It’s no time to be dainty, however, as tentacle like structures suddenly burst through the city of Manhattan, tightly gripping skyscrapers and vehicles as it rises upwards into a spire. Creatures called the Twisted accompany the sudden organic infestation, and Aya is put on the mission to dispatch them. 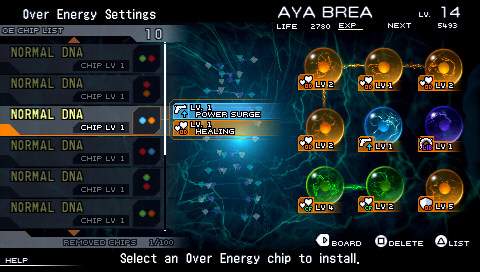 For those unfamiliar with the franchise -- perhaps just wanting to jump on a flashy new PSP title -- Aya is basically a cop with biological alterations within the makeup of her cells. She may not look it, but she’s 38 years old, and looks great in jeans. The craziness that is her body also allows her to dive into the souls of other organisms, and with the help of the Counter Twisted Organization, she is now able to dive across different time periods, squarely becoming the world’s secret weapon and last hope. Jumping into the body of a national guard, Aya manifests herself onto the snowy streets of a terrorized city. Although some wonderfully melancholic piano chills the air, and although it’s another morbid and interesting premise of chemically engineered horror, the game at this point makes it clear as to why it’s parting ways with the franchise name. Abandoning nearly all RPG elements of the past, it’s now a fast paced lock on shooter, complete with a responsive roll dodge, a constant thirst for ammo, and magazine exhausting gunplay. The game proceeds in an episodic structure, ranking player performance based on completion time, damage taken, and awarding mini achievements for certain milestones. But the arcade feel unfortunately comes packaged with arcade characters as well. Aya is indeed a bit of bore in The 3rd Birthday, but if this destruction of a loved personality is reason to turn off returning fans, rest assure the amnesia backed twist pays off, and is arguably the narrative’s greatest strength. The other characters that compromise the crack CTI team, however, have no such convenient excuse for their abhorrently flat personalities. There’s your military guru, the scientist with ulterior motives, and the wimpy computer guy who’s great at “hacking.” Not that these characters couldn’t prove the lazy clichés wrong, it’s just they don’t. Anything outside of the central scenes with Aya really does feel like the filler of a typical guncon game found in the lobby of a movie theatre. It’s a mess, and a real shame given the game’s admittedly interesting take on the Parasite Eve universe. It’s a complex tale that gets none of the complex writing it deserves, and while the ending introduces an incredibly cool turn of events and apt explanation of Ms. Brea’s predicament, it comes off as wasteful given the stilted and awkward script it had to be mounted upon. At least Aya, in her newfound state of vulnerability, is more than capable in finding answers for herself through her still maintained combat prowess. The action is quite good, too, as the game nails down the gratification of basic gun mechanics. Health bars melt to assault rifles, a well placed shot gun blast rewards tons of damage, and although sniper rifles require careful manual aim – a hit nearly guarantees the kill. This basic sequence of the shooter genome has been in place for a while now, and perhaps that’s enough for some people. But no one puts Aya Brea in a new game without tweaking a little DNA. Throughout much of the game is the presence of the U.S. National Guard, doing their best to fight alongside the player, which as in most games with such A.I. – isn’t much. But with the ability to dive into the souls of surrounding allies, the soldiers make for excellent tools and give The 3rd Birthday a very real and fluid layer of strategic depth. A quick press and release of a button and Aya will find herself at another point on the battlefield, exchanging positions with another soldier, and grabbing whatever weapon he was holding. These brave young men provide crucial opportunities to get out of tight situations, gain better vantage points, or to jump to those with more powerful weaponry. Even if Aya is dying and “Game Over” is creeping up onto the screen, she can dive into a nearby ally should they appear in time. More gentle natured gamers may feel consumed with guilt over the blatant abuse of other humans as strategic vessels, leaving poor men behind to be eaten where Aya had just been standing moments before (less sympathetic players need not worry, as reinforcements are often provided). But there’s an alternative, more respectable use of the soldiers in the form of the Crossfire ability. Managing to dodge enemy attacks while charging the lock on will let Aya command a focused hail of bullets from her comrades, tearing apart more powerful enemies rather quickly. Pumping damage into the Twisted at a fast rate also leaves them vulnerable for Aya to use her offensive overdive maneuver, eviscerating enemies from the inside for massive damage. The 3rd Birthday’s RPG elements don’t dive nearly as deep, but to no surprise, do manage to offer a wide arsenal of weaponry to purchase and experiment with. Tradeoffs between a gun’s handling, power, clip size, and impact (how effective the weapon is at opening up an enemy for a dive attack), make for an interesting variation of approaches. Aya’s DNA can also be played with in between missions, offering some not very noticeable, but sometimes useful passive and chance effects during battle. And with a nod to its own ridiculous nature, the game considers Aya’s street clothes as her armor value, so players can keep track of how they’re doing by paying note to how much she’s got left on. A valuable tool or fanservice, it may be appreciated either way. Playing with someone's DNA can be dangerous, so watch out for mutations that can negatively affect Aya in battle. 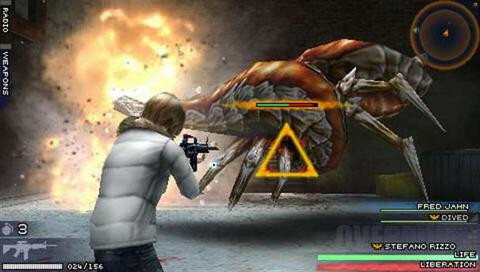 Real time jean tearing and other aspects make this a pretty convincing PSP title -- especially the quality of the cutscenes -- but after taking players through wintry urban environments and a warmly lit night club, the game’s level design gradually turns into the disappointingly brown habitats of the Twisted. Small barriers to take cover behind often look random and out of place, giving a cheap feeling to some skirmishes. And when everything begins to look the same, the modest time stamp at the beginning of each mission does little to remind players of what time there are in or why. What’s most important, though, is that the game is smooth running and responsive. And the Twisted are hardly pushovers, so Aya will take what she can get. The invaders incorporate vicious and fast moving melee attacks, a constant flow of projectiles, artillery from afar, and teleporting behemoths called Reavers that will require multiple cross fires, grenades, and dive attacks to take down while avoiding their game ending attack patterns. It’s a challenging, albeit small set of enemy types, with some lazy color swapping done in the latter portions of the campaign to make enemies seem new. Spraying lead at the same abominations does get tiresome, but they’ll be spawning points to destroy, walls to tear down, C4 to be planted, and traps to be dodged within the encounters as well. Suffice to say, the game demands unwavering attention. Aya can lose much of her outfit in battle, purely for gameplay purposes, of course. More threatening to Manhattan than any sort of horror the Twisted can come up with, however, is the game’s camera. 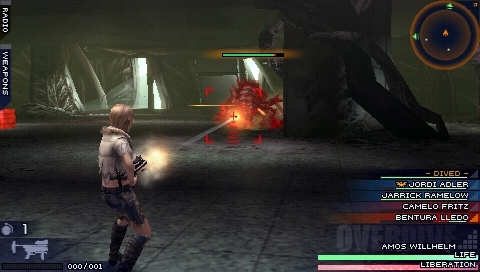 With such a high demand for reflexes and use of Aya’s overdiving, the camera and interrelated lock on feature often prove as the biggest obstacles for the player. There’s simply no practical way to adjust these features without sacrificing a great deal of health doing so. Primarily, the camera suffers in the game’s many corridor encounters, where Aya finds herself pitted against several powerful creatures in small rooms. It’s a guessing game of what terrible monstrosity is behind her, or what delightful attack it has in store. There just isn’t time to simultaneously rotate a camera while rolling to safety. Locking on – the solution to camera shifting – handicaps the alacrity of her dodging game immensely, and this is even more troublesome in open environments where every damn unit type in the game has found its way onto the battlefield. Anytime a lock on needs to be dropped in favor of evasive maneuvering, there’s nearly no chance that target will be found again -- unless Aya wants a face full of toxic gas bubbles from any of the other 8 dancing balloon creatures around her. Which one was almost dead a second ago? It’s best not to wonder. The game is rewarding enough to tough its campaign out, though probably not nearly so much as to warrant multiple playthroughs which some of the unlockable cheat codes and costumes demand. 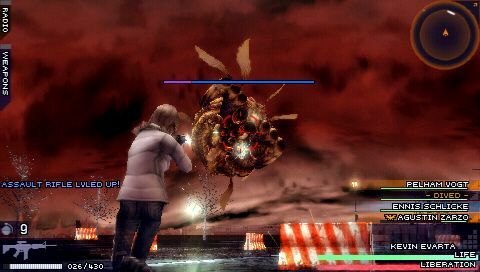 Bosses do offer an enjoyable breather from the more chaotic setups, and maybe they are typical weak spot shooting frenzies, but they capitalize on how great the game controls when there’s only one enemy to worry about. It’s a hard game to give up on, either derived from a bloated gamer ego that won’t accept defeat from a camera, or just how entertaining it is to pretend how Aya’s diving ability essentially makes her Agent Smith from The Matrix. What's hard to pretend, however, is that The 3rd Birthday's intensity is the product of polished design. Indeed, it's challenging often for the wrong reasons, and moved with a history and script that’s inaccessible to newcomers, and even offensive to returning fans. 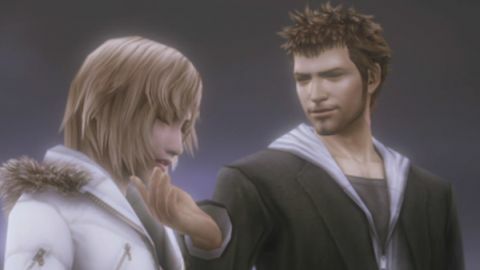 But when the ending comes round, it’s clearly a dedication to Aya Brea’s legacy, and a reflection on the game’s merits deserves some chin stroking approval from everyone. Its ambition is bottlenecked heavily by control issues (hardware ones, really), but it can be a denim shredding good time, and stands as one of the best shooters on the PSP -- though that bar was never set incredibly high. Enjoy it before it starts looking old. Much like complimenting a kindergartner for coloring within the lines, Final Fantasy’s structure can be called sensible. If you enjoyed this The 3rd Birthday review, you're encouraged to discuss it with the author and with other members of the site's community. If you don't already have an HonestGamers account, you can sign up for one in a snap. Thank you for reading! I've put the review up, but I'm going to come across all strict now. Are you ready to take note of my strictness? We need to avoid posting screens that are watermarked by other sites, lame as hell as watermarking is. Just this once, as I'm a much cooler guy than most of this website would have you believe, I'm going to do some asset fishing and swap the infected ones out myself. Please take more care in future. For every watermarked screen you post, Jason venter dies a little inside. I'm also putting the review up because it's very good. Wahhh, I'm usually good at spotting those! My apologies. Thanks for the help and the warning. And don't mind me while I edit a couple typos. EDIT: And please note, the "OVERDIVE" in the corner of the screen is part of the game, not a watermark. They're not exact matches, but they're as close as I could find on a quick skim. Feel free to edit them away if you find better. None of the material contained within this site may be reproduced in any conceivable fashion without permission from the author(s) of said material. This site is not sponsored or endorsed by Nintendo, Sega, Sony, Microsoft, or any other such party. The 3rd Birthday is a registered trademark of its copyright holder. This site makes no claim to The 3rd Birthday, its characters, screenshots, artwork, music, or any intellectual property contained within. Opinions expressed on this site do not necessarily represent the opinion of site staff or sponsors. Staff and freelance reviews are typically written based on time spent with a retail review copy or review key for the game that is provided by its publisher.